Here's a list of top scorers in today's quiz 'Mixed Bag Quiz'. Congratulations to all the top rankers. 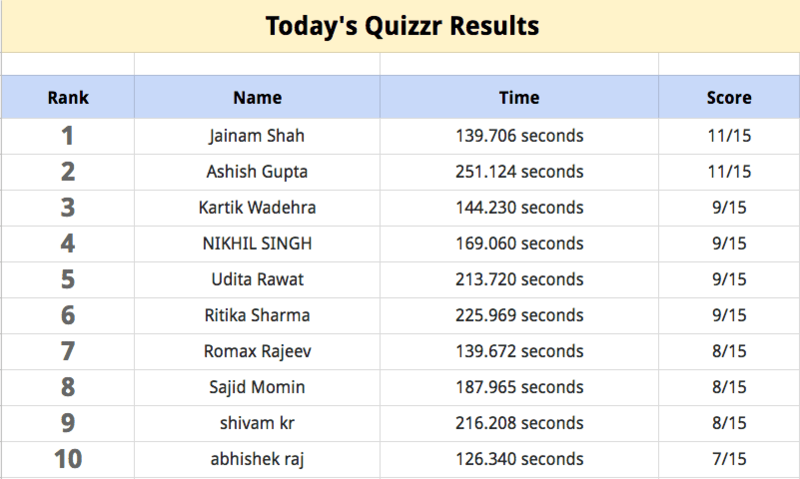 Everyone who participated in the quiz - we hope you enjoyed the quiz. Did anyone among you got 'You are late' message after answering a few questions? Please get in touch on 'hello@crazyengineers.com'. Questions were good but you should include more GK from India. Timer should be 1.30 minutes. Just wondering,who all in leader board get rewarded ? Do all ranks get rewarded or just 1st rank? Yep ! I got that message at start itself. Questions were good but you should include more GK from India. ... and that's exactly the opposite of the feedback we've received so far. Questions will be 'global' and will definitely have questions 'from/about/stuff happening in' India. Timer should be 1.30 minutes. ...it takes out all the fun and gives people ample time to search for answers on Google. wondering,who all in leader board get rewarded ? No rewards yet. We do plan to introduce rewards for special quizzes. There's a 'Premium' membership plan coming up and that will decide whether we can offer rewards. Our team gets super exhausted in creating and managing these quizzes. Do all ranks get rewarded or just 1st rank? No rank gets rewarded. It is likely to change in near future. If you got the message at the start, then it means you missed the start time. I was eagerly waiting 5 min prior, but i figured it out "crome was outdated"